This article appears in The Handbook of Business Strategy Fall 2002 and was featured on HR.com on April 14, 2003 and in Supply Knowledge in the May 2003 issue. Today's drivers of success are speed, cost and quality. One way to harness these drivers is through the formation and development of high performance teams. In virtually every organization, teams can be used to realize a plethora of short and long-term goals and outcomes. In fact, their agenda of responsibilities can be staggering. Accordingly, it's important to look at not only how teams are formed but also how they are nurtured and encouraged to achieve continuous positive outcomes. If these two areas are not considered, teams are likely to get so overwhelmed in detail, they forget their purpose, become disinterested, distracted and ultimately accomplish very little. New teams are more successful when they have a jumpstart and from time to time every team will need a restart. For these reasons, it's important to look at which models corporate teams can follow to keep the process running smoothly. What is a team? Authors and consultants Jon R. Katzenbach and Douglas A. Smith undoubtedly summed it up best in their book, The Wisdom of Teams. They describe teams as: "A small number of people with complementary skills who are committed to a common purpose, performance goals, and approach for which they hold themselves mutually accountable." Creative problem solving - Because team members have varied expertise and experience, they approach problems from many perspectives. With diverse perspectives at its disposal, a team is much less likely to view a problem narrow mindedly and much more likely to generate a broad array of potential solutions. Use of the resources of individuals - A team can collectively decide how to divide work to make the best possible use of each person's knowledge and skills. Motivating each member to contribute to the fullest extent - Because team members work interdependently toward shared goals they believe are important, they can motivate each other to work at their highest levels. Improved communications - Team members quickly find out that the only way to work interdependently and to achieve their shared goals is to communicate with each other clearly, honestly and frequently. Teams have existed for hundreds of years in every conceivable circumstance, such as in factories, corporate settings, research laboratories, universities and on the playing field. Today, what's unique about teams is their ubiquity - their ability to become cross-functional teams and even virtual teams by means of Internet capabilities and technology. At some point, everyone finds himself or herself on one team or another regardless of its technological or physical makeup. In some cases the experiences and outcomes are quite successful, while others are a complete waste of time. This occurs primarily because the ground rules and clear goals were not laid out early on in the process. In order for teams to be high performing, each team member must understand what it takes to work in a collaborative effort from the start. What can stand in the way of success are unclear goals, conflict among team members, a lack of resources and a lack of management understanding. How many times have team members said, "If only we had done X, this team would have accomplished more and been more successful?" While anyone can look back and ask, "What if?" the key to success is for each individual team member to be involved in setting the team's goal. In the past, setting team goals was generally reserved for management. However, today's best team outcomes occur when team members are involved in setting goals from which they can create positive outcomes. Cross-functional and cross-organizational teams also allow organizations to take advantage of new information more quickly because that information can be integrated by whole teams rather than by just one individual. High performance teams don't just happen magically. They are architecturally made up of carefully selected individuals with complementary knowledge and experience, who are willing to work together toward a common goal. Individuals who have been members of high performing teams in the past are more likely to understand the benefits and therefore be willing to engage in the team formation process simply because they understand how much better the team functions when the entire group is united in a common purpose and goal. First-time team members who are new to the high performance team concept should be willing to engage in the process with the understanding that it will lead to more team collaboration. Again, no one individual has the knowledge or ability to tackle highly complex problems solo. As David Bagby, senior director of business development at a major networking company in Silicon Valley explains, members of successful teams can conceptualize what their individual roles are and understand from the beginning what their goals are. "Most organizations take a bunch of people, throw them together and tell them they are working on a specific team project, and then they wonder why it doesn't go smoothly. If you are wearing the management hat you gradually being to figure out that there are various reasons why these people are working on this particular project," says Bagby. "You have to get down to what is motivating each individual team member. I find that you can get a team to get along a lot better if the members of the team have some conception for what's motivating the other members. That's not generally a conversation that ever happens by default. At least I have never witnessed any team members walking in and announcing their intentions and purpose to the rest of the team." Setting clear goals - Goals that are believable, achievable and agreed to by the team. Keeping team members on track - Work with the team to constantly monitor its progress and modify its directions or tasks when appropriate. 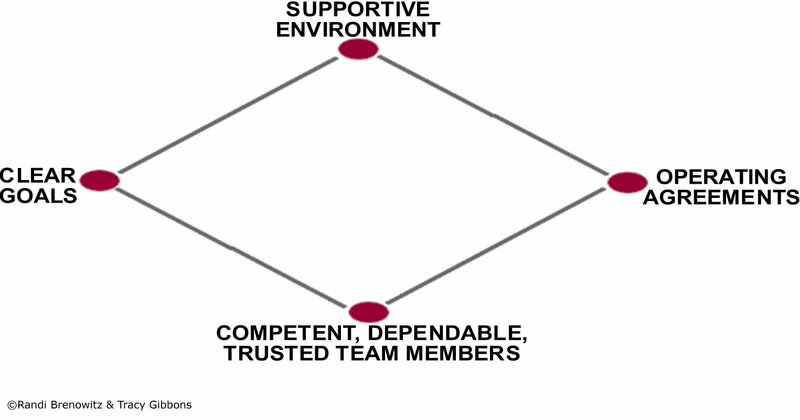 Retaining harmony among team members - However, harmony is not the only goal. Some conflict and contention is actually desirable on a team. What is needed is a leader who knows how to arrive at a consensus when there are differing points of view. Communicate regularly -The team leader's job is to communicate regularly and inform senior management of the team's progress, apprise them of any problems and to secure the necessary resources that will help the team achieve its goals. Also, the team leader needs to get from senior management any changes in strategy, direction or the corporate mission that might affect the team's work. Bagby agrees that in order to form, maintain and keep a team on track all of the above elements need to be in place. "In order to keep a team motivated it needs clear goals. Also, team members need to take responsibility and embrace the fact that they are committed to the team's goal. A big part of it is buy-in. In my experience I had teams that existed in name but not in spirit and cooperation," says Bagby. Just as there are a large number of teams existing in corporate America today, there may be an equal number of training and consulting firms offering programs for team effectiveness. While some may work for the short-term, long-term effectiveness is not always attained. Why? Most often the reason for failure is due to the lack of appropriate models or blueprints to follow as well as lack of management follow-through and commitment. Supportive Environment. Any team effort is doomed from the beginning if it's not receiving internal support from management. For example, has management provided the team with the essential materials it needs to get the job done? Are team members meeting in a desirable location, and do they have the necessary tools to complete their tasks? (i.e. research materials, computers, networks, high-speed Internet connection, laboratories, groupware tools, electronic bulletin boards, etc.) Does the team leader brief management on the team's progress? This level of support speaks volumes to team members, boosting morale and ensuring all members that senior management notices and appreciates their efforts toward achieving the corporate strategy. Clear Goals. Setting clear goals provides structure and direction for each individual member of the team. It provides a mental picture of accomplishment for each team member to strive toward. Clear goals also create the context in which team members can make their day-to-day decisions. This is especially important in cross-functional teams because with a single functional team, the team leader is also clearly the boss. With a cross-functional team, the members are in a matrixed organization. As a result, they have to answer to the team leader and their functional boss. The more team members are told about team goals, priorities and the direction of the team, the better they'll be able to represent the team when they go back to their functions. For a team to be effective, clear goals need to be established and agreed upon from the very beginning. Team involvement in setting goals will increase each member's buy-in and commitment. This will be important when times get difficult and hard trade-offs need to be made. Remember as well that goals don't necessarily have to be huge accomplishments. The very fact that cross-functional teams gather in the first place may be a small goal toward organizing a high performance team. As well, goals can happen at each session or after many team meetings. However, of utmost importance is that team members define team goals and work in unison toward reaching those goals. Also, an agreement amongst the entire team needs to be made in regard to what specific tools and formats will be used (i.e. electronic bulletin boards, email, face-to-face, voice mail, etc.). While everybody has preferences, a clear agreement must be made about which of these will work the best for the team. Assuming everyone automatically knows and understands these details is a mistake. For example, it's not fair to assume that email responses will be received in a timely fashion unless ground rules for email replies are established. Some team members may define a "timely fashion" as several days, while others may think it means before the end of the business day, two hours after the meeting ends or even next month. Here, too, the entire team must reach an agreement on their perception of "timely fashion". The creation of the Operating Agreements serves as one element of the team building process, as the very fact that a team is meeting to create a set of Operating Agreements is in itself an experience of the team setting and reaching a goal. Once completed, the team's new set of rules can be used for the duration of the team's existence. Competent, Dependable, Trusted Team Members. The last piece of the model, and probably the most difficult, is selecting team members based on competence, dependability and the ability to build trust. While no one is perfect, it certainly stands to reason that team members want to be assured that their fellow teammates can be trusted to come through with their assignments. Can they be counted on to come through with their assignments and tasks? Can they be trusted with confidential information? There is also a comfort factor, which is one indication that trust exists. People who don't trust each other are usually not very friendly toward each other. Managers or team leaders need to evaluate how comfortable members of the team are with each other. Do they joke around and have some fun with the process? These are indicators that the team members are creating a bond, which is necessary for a common goal and comfortable working relationships. Highly motivated teams hinge their successes on the respective dependability and trust of each member. Fostering dependability and trust is exactly what helped jumpstart David Bagby's corporate team. "In the formation of many teams you may end up with members who set up pecking orders and others who want to be the star at the expense of everyone else on the team," adds Bagby. "My point to them is that I do not reward them for taking on that role. I reward them for getting the task at hand done as a team. I want them to re-direct that energy into something constructive." Finally, trust, is one of the model's most important elements. Quite frankly, it's the hardest piece of the model to accomplish and when lacking, the quickest to destroy the entire process. Teams that embrace a healthy set of agreements and keep them over time will begin to see that they are actually building on the element of trust. Any team member who relinquishes his/her agreement to complete a task breaks that trust. If team members agree to do certain tasks and don't, they have created problems for themselves and their goals as team members. Failing to realize the importance of being competent, dependable and trusted, harms the entire process. A surefire way to diminish the efforts of any high performance team is to ignore any one of the elements assuming that every member of the team just needs to tackle the project at hand. Examining each element of the Team Essentials Model is worth the time and will ensure that all team members are part of establishing the goals and strategies of the team and will put all of their efforts into meeting their deliverables. Sometimes members will take more time with one or more of the elements in order to gain a comfort level, which could enable them to work faster later. Being too quick to get to the task can sometimes hurt the team more than help. Too many "super-charged" teams dive into the process too quickly, only to spend far more time later rehashing what went wrong with the team's process and foundation rather than achieving their significant goals. While utilizing the elements of the Team Essentials Model may take some time, once a team becomes proficient in looking at their processes through this model's lens, members can move along much quicker. In addition, the model also works well with virtual teams (teams that are formed with distant members via the technology of the Internet), but requires some implementation modification. There are literally hundreds of tools that are available to teams. Every day the Internet avails new ones. Many of these tools are outstanding and are essentials for teams to become high performing. On the other hand, tools must be introduced within the appropriate context. Consider the analogy of building a house. Providing even the best-intentioned person with a hammer, saw and sufficient wood will not guarantee the final outcome will be a house. For the same reason, you can't throw a group of people into a room with tools and expect them to provide successful outcomes. Teams will be successful if they are given the right tools, which are used in conjunction with an overall plan, proper training and direction, as well as team agreements. The Team Essentials Model provides teams with a simple, understandable and powerful performance tool that can be adapted to any organization's team efforts. This is a working model that has helped jumpstart many teams nationwide. It provides a well-defined way to approach a complex topic. It's explained quickly, and most importantly it can be used by anyone in any type of industry or organization. In a perfect world teams would be comprised of intelligent, capable individuals who are capable of realistically solving problems and reaching attainable goals. The perfect team is made up only of members who can work collaboratively and reach mutual agreed upon goals. However, it's not a perfect world, nor are teams always the perfect combination of people and ideas. In fact, many managers believe that teams are more trouble than they are worth. That may be the case when teams are given little direction, no guidance, no tools to complete their tasks, no training, and no clear model to help them identify the process from the beginning to the end. Given these important considerations, many organizations may soon be rethinking how to address their attitudes towards company teams. If corporate America beings to seriously consider providing teams with a solid foundation, a reputable model to follow, and enthusiastic support, more teams will achieve their levels of desired success. Randi S. Brenowitz is principal at Brenowitz Consulting, a Palo Alto, California-based Organization Development Consulting firm dedicated to improving productivity through teamwork and collaboration. For over 20 years Brenowitz has worked in partnership with her clients to develop teams, team leaders and team members in order to create collaborative work environments and increase corporate productivity. To subscribe to Tools for Teams, her electronic newsletter, email newsletter@brenowitzconsulting.com. For more information, contact Brenowitz Consulting at (650) 843-1611 or visit her website at www.brenowitzconsulting.com.